We started the Elf on the Shelf a couple years ago when we received him as a gift. Our elf normally comes out on St. Nick's Day (12/6). Eugene P. Elfington III (our elf) is sometimes forgetful and doesn't move every night. This year, I am going to try harder. I figure if I post where he goes, then I have to move him each night. I'm sure most of you know the story of the Elf on the Shelf. But in case you don't, here it is. 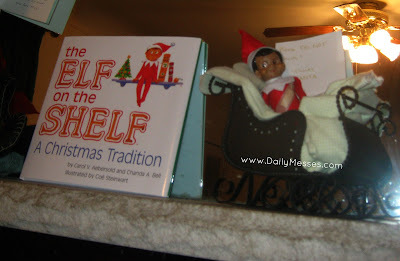 The Elf comes to your house and observes everyone during the day. He reports back to Santa at night (hence why he moves each night). You are not allowed to touch him! We told the kiddos this when we first got Eugene and of course Bernardo touched him. Due to the incident, Eugene lost his magic and didn't move that night. Santa provided him with a band-aide instead. The kids have left him alone after that. Eugene in a sleigh with a blanket and a band-aide after being touched. There is also a girl version of the Elf on the Shelf (girl).